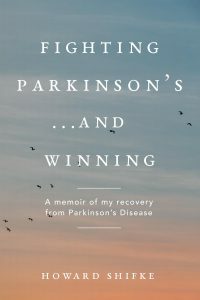 Please Note: Parkinson’s Blog Talk Radio has resolved their technical issues and my 90-minute interview has been uploaded to their site at http://www.blogtalkradio.com/parkinsons-recovery. If you scroll down to “Featured Episode,” they provide you the ability to download the interview so you do not have to be at your computer on a specific Wednesday night to hear the interview and you can listen to it in parts or replay parts if you wish to hear them again. Important note: If you click the link, scroll down and click play, you will have to sit there for 90 minutes to hear the entire interview. If you click download, you will have the 90-minute interview on your computer and may listen to it as you wish. One of the people I am coaching with her Parkinson’s who is working through the “recipe for recovery” recently had a lessening of tremors, and for certain moments, the tremors seemed to disappear. She had some specific questions about FSR (Forceless Spontaneous Release, a form of Yin Tui Na foot holding that is discussed at length earlier this blog), prayer and surrender, and she asked my opinion. Here are my thoughts. No one thing will bring the disease to a head, and no one thing will cure it. However, your awareness of what is going on in your body and your understanding of how your body is reacting to events will go a long way toward recovery. When you are doing activities that take your mind off of the disease and you do not notice the tremors, that is wonderful…so, do not be concerned during resting periods of time if you still feel them…it shows you that living your life (last blog post) presents you with a mind and spirit that transcends the tremors to the point that sometimes you do not even notice they are there. Regarding the foot problem and FSR, I still feel that the pdrecovery.org group is correct that an old foot/ankle injury unresolved makes the stomach meridian flow in the incorrect direction and is an issue with Parkinson’s. Please note, it is an issue, not the only issue as some people hope (they hope this so somebody outside themselves can “cure” them by holding their foot). Even the pdrecovery.org’s literature says this is incorrect. You need the meditations and prayers and affirmations and surrender to open your heart…this is the part that many people have a hard time with or want to skip altogether…they are neglecting key components for recovery. Prayer and surrender are huge. Connecting your Inner Divine to the greater Healing Power, your Higher Power, is huge. Part of how you do this is by jumping in with the Medical Qigong for Liver, Medical Qigong for Kidney, Clearing Liver Wind Qigong, Chanting,Jin Shin Jyutstu, Standing and Balance exercise, improving your dietary habits, etc. (more details in recipe for recovery). By doing these things, you are changing the Parkinson’s landscape and it is loosening its grip on you. Here’s the hard part: Try not to over-think what is occurring, good or bad, which is part of surrendering. Try to accept that what is supposed to happen will happen when it is supposed to happen, and to show your faith, you keep doing what you are doing. That is part of surrendering. The first time in 8 months I started to walk a little normal, I thought, “This can’t be happening, I have Parkinson’s.” Then I quickly changed my thought to “This is happening, I am getting rid of Parkinson’s.” And then I let it go. It was another 5 or 6 days until I had the experience again, but I did not worry because my Higher Power had given me a sign that I was on the correct path. Until that time, it was faith and surrender. After that time, it was faith and surrender with a suppressed excitement because I felt like I was holding a gold nugget in my pocket. This entry was posted in Fighting Parkinson's Drug Free and tagged and surrender, fighting parkinson’s. Bookmark the permalink.